We went to Jasper on the BC/ Alberta border for our first camping trip of the summer. Jasper is just gorgeous and also has lots of things to do as a family. We went canoeing, fishing and on the Jasper Tramway. We've been doing a lot of camping recently and I decided to do a mini series on cooking food for camping. Camping food has to be easy, usually one pot, nutritious, requiring minimal preparation (the fresh air takes it toll on energy levels) and tasty. Sounds like a long list doesn't it? 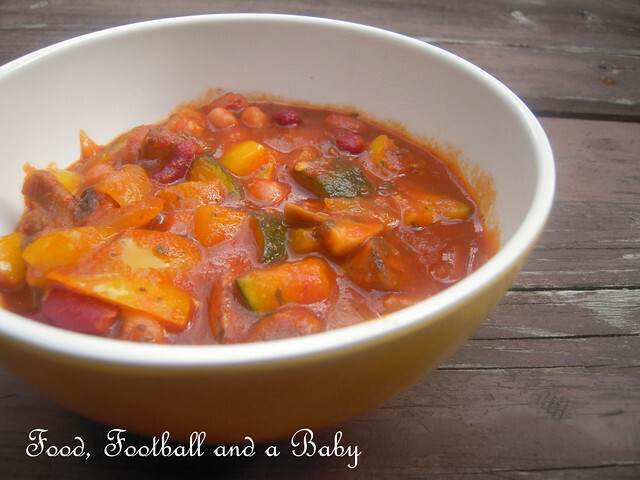 My first recipe is for an easy veggie chili, that can also be made with meat, if you prefer. You can save time at the campsite if you chop all the vegetables up before leaving home. You can use pretty much any vegetables you want and keep it seasonal. Make the spice mix in advance and store in a small tupperware container. In a large pot, add oil and fry the onions, until soft (if using minced meat, add it at this stage and fry for about 5 - 7 minutes, till cooked through) Add the spice mix, and saute for another minute. Add the rest of the ingredients, mix thoroughly and let the chili simmer for about 20 - 30 minutes. Season to taste and serve with chunks of fresh bread or over rice. Looks great and certainly more nutritious than my own standard recipe, but I am addicted to using Herbs de Provence (just a teaspoon full) and an additional can of baked beans, which really thickens it up nicely (oh, just remembered, you can't get those there - sorry!). But camping with a toddler must be hard, hard work. Not for me - my father (a scoutmaster) put me off camping by ensuring we camped at least three times a year for about ten years. He enjoyed 'challenging' camps - like on the side of Pen Y Ghent in a freezing spring! Or the one where he chose a seasonal stream bed and when the water started coming up and flowing, insisted we dig a trench around the tent to defy the elements! I found that camping in Canada is very different from the UK. Its more organised, for one and more space. Plus, they usually have standard facilities like good showers and toilets and that makes a hell of a difference. There is real wilderness camping, but that's a whole different beast. Husband and I did the Bowron Lakes canoe circuit for the honeymoon and that was more challenging camping. Going to try the herbes de provence idea though, thanks! WoW Michelle!! you make me wanna camp!!! I am gonna try this whether we camp or not!! Just one query, How do I go about cleaning and cutting an artichoke?? They are available here, but i am clueless as to how to go about!!! Hiya Michelle, well I've cooked it and it works really well. The only problem was that I had to use Cumin seeds and ground them rather laboriously with a Mortar and Pestle! But I deviated in that 3 tablespoons of ground cumin seemed a bit much and I used 2 really hot chillis (I'll probably use 4 next time - I'm addicted to them! ); this was my first cooking attempt with veggie mince and the veggie version works really well. I particularly liked the texture contrasts between the ingredients! But do you really mean 3 tablespoons of cumin? - that's a helluva lot, so I throttled it back to about 3 tsp! And it was still pretty strong, but that may be using seed and not the ground stuff. As before I always add some herbs and so about half a cup of chopped coriander leaf went in. Heartfelt thanks and this one's now in the 'do it again' book!